In the UK, manufacturing is a thriving industry that directly employs 2.6 million people and sectors such as the aerospace industry generate annual revenue in excess of £30 billion, providing excellent careers for well over 100,000 people. Our position as a major world player is founded on a highly-skilled workforce, institutional knowledge and a history of technological advances. Retaining this strong global reputation is essential to economic wellbeing but also continued growth. However, the world is changing fast. New advances in automation are transforming traditional processes, with industrial robots replacing people in more and more industries. We need to question whether a skilled workforce will be needed in the future. If robots will be making autonomous decisions driven by “big-data”, we can imagine a future with no requirement for human intervention in the manufacturing process, and therefore no need to maintain a strong skills base. This logic is flawed, of course. It is only through a deep human understanding of manufacturing processes that a shift towards automation is possible at all. The companies and industries that invest in skills and training will be the ones that make the fastest advances in automation. Nobody knows exactly what the brave new world of manufacturing will look like, but we know for sure that companies and their workforce will need to be flexible, and employees will need to learn new skills constantly to keep pace with global trends. No apprenticeship or university degree, however good (and many are excellent), can hope to equip its participants with a complete skillset to get them through the next 40 years. We all need to keep learning and adapting to the new demands of our changing roles. For the manufacturing industry, metrology is a key enabler for the move towards Industry 4.0 philosophies becoming a reality in the highly-automated factories of tomorrow, and workplace training will play a key part in that story. Enormous success can be achieved with dimensional metrology courses. In just a few days learners pick up new skills, brush up on lapsed memories of tolerancing and process control, and take part in carefully designed practical exercises to ensure that the new information will stick. Training delegates on the NPL Dimensional Measurement User (Level 1) course working through their practical assignments. The South West is of course renowned for its aerospace industry that is important to both the local and national economy. However, the region has other emerging areas of engineering excellence including composites, medical, additive manufacturing and industrial digitisation which are all enjoying rapid growth. Much of this is a direct result of learning skills that improve productivity to a world class level. 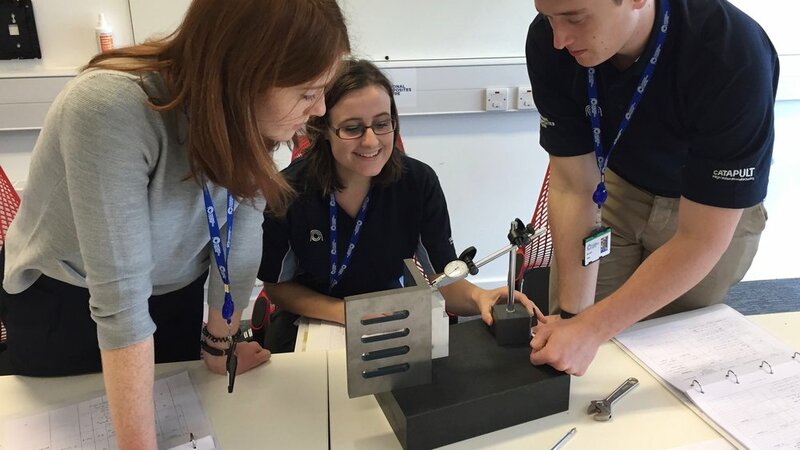 Schemes such as Sharing in Growth have helped UK aerospace suppliers achieve more than £3.4 billion in contracts and INSPHERE represent the National Physical Laboratory (NPL) as one of the training delivers within the scheme. INSPHERE deliver regular NPL Dimensional Measurement Courses at dedicated training facilities in Bristol, and beyond. NPL's Training Framework has been validated for industrial relevance by the National Skills Academy for Manufacturing (NSA-M). These foundations help to build effective communication of measurement principles, and critically they engender a questioning culture within organisations, enabling teams from mixed backgrounds to move towards better manufacturing processes, founded on firm evidence. As metrology specialists, INSPHERE are also able to deliver bespoke training including Portable Metrology Good Practice and we are also the only UK approved training deliverer for SpatialAnalyzer to be endorsed by New River Kinematics (NRK). If you are interested in how INSPHERE can help with increasing productivity and upskilling your current workforce, visit www.insphereltd.com or contact us for further information on how our expertise and best-practice measurement approaches can help your company.